North Barrington, IL - April 28, 2015 - After garnering Championships at WEF, St. Louis and Ledges this past winter, Old Barrington Farm riders are confident and excited to start a great spring and summer show season. Trainer Amelia McArdle and Assistant Trainer Julie Smith are proud of the progress and successes of their students. 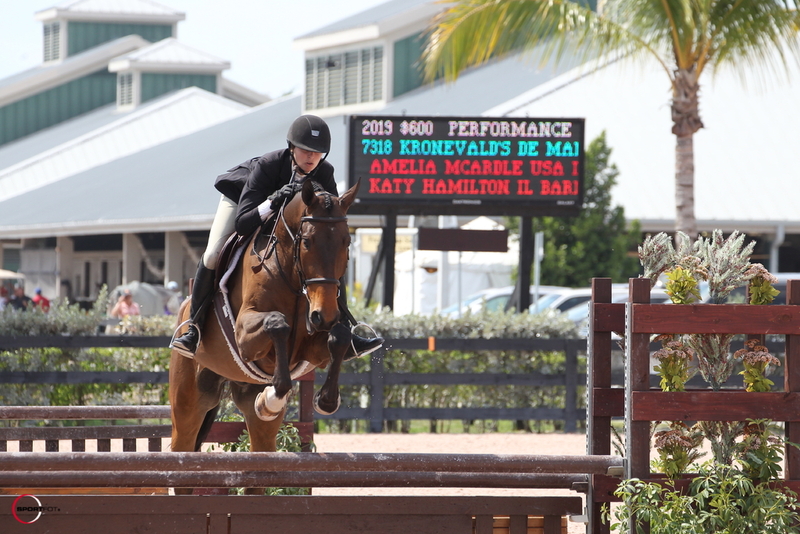 One of Amelia’s students, Katy Hamilton, competed at WEF for the first time, spending just a few weeks in Florida during her school’s spring break. Riding Old Barrington Farm’s 16-year-old bay mare, Sacha 12, Katy was WEF Champion in the High Children’s Jumpers 15-17 division. Katy credits much of her success to the fact that she and Amelia plan out goals and a strategy to achieve them. “Since last year, when I started with Amelia, I have gone from doing the 2’6” hunters with my young hunter to doing the junior hunters with him. I just started jumpers, which I always have wanted to do, and I achieved a WEF Championship in the High Children’s Jumpers,” Katy explains. Brooke Saltzman, another of Amelia’s students, was excited to return to WEF after her first experience there last year. Competing with Old Barrington Farm’s jumper, Nicholas, Brooke stepped into the ring at WEF and won the blue in the Children’s Modified division speed class. 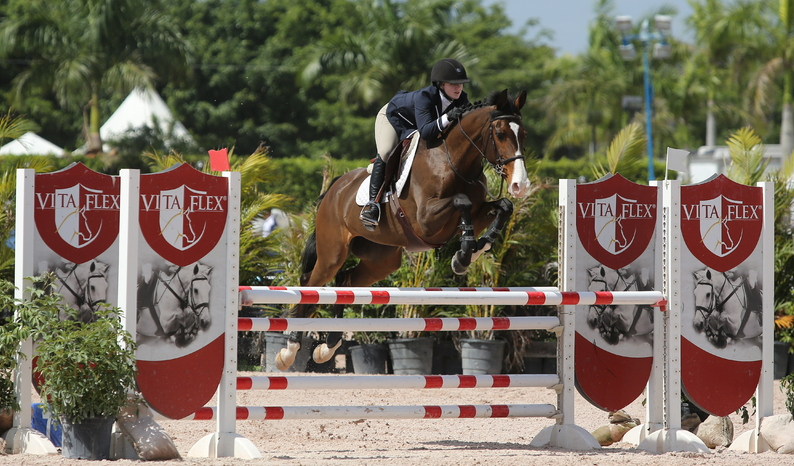 During WEF, Brooke and Nicholas moved up to the Low Junior Jumper division, which often has upwards of 70 competitors at WEF, and won ribbons in that division as well. Olivia Pollina has been working with Amelia to start jumping a former dressage horse, Hawthorne, in the Baby Green Hunters and Low Hunters. 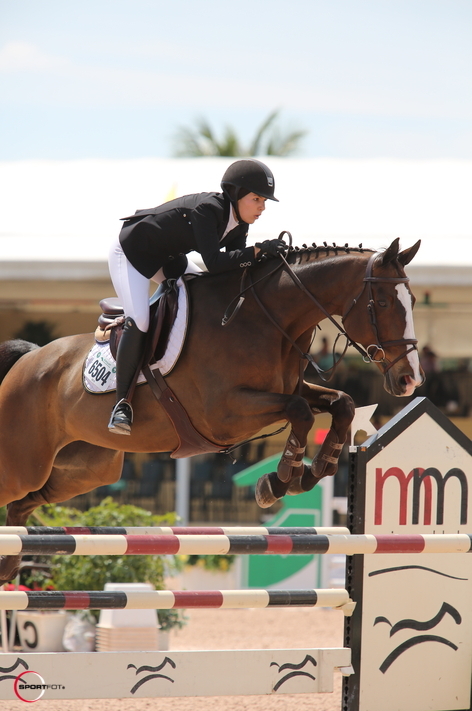 In Hawthorne’s very first hunter jumper horse show, at WEF, Amelia showed Hawthorne during the week and Livi showed him on the weekends. Hawthorne collected ribbons in both divisions with both riders, including a 5th place showing out of 48 Low Hunters. 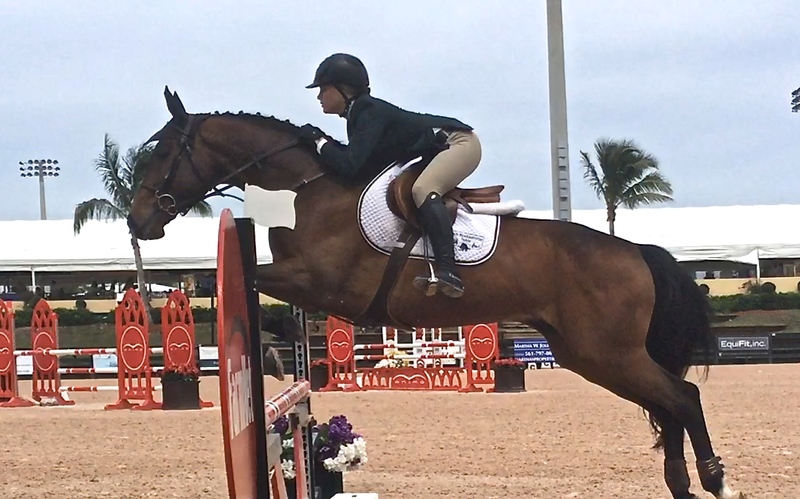 Livi was also just getting to know her new horse, the 14-year-old Argentinian warmblood Bravoman, breaking into the top three ribbons in the Low Children’s Jumpers in St. Louis, and then again in the High Children’s Jumpers at WEF. For those families who did not go to WEF this year, Amelia made sure that their riding and competing could continue to progress. Emily Britton stepped into the jumper ring for the first time ever at the St. Louis Horse Show, clinching the Reserve Champion spot in the Low Children’s Jumpers with a pair of second-place finishes. “OBF has a great team of riders who encourage and help one another along the way,” notes Emily. “It’s a fun barn family and environment to spend almost all of my time in!” adds Katy. Kate Pollina continued to campaign her multi-championship Large Green Pony Hunter, Jolly Roger, at Ledges and in St. Louis, winning Champion and Reserve Champion, respectively. Old Barrington Farm will be competing in the upcoming Kentucky Spring Horse Shows, and then the Showplace Spring Spectacular series. Amelia, Julie, and their students will be hosting a party at Old Barrington, a short drive from Lamplight, open to all exhibitors and staff at the Spring Spectacular. “We encourage all barns at the Spring Spectacular to put together teams of 6 to compete in our Barn vs. Barn Extreme Obstacle Course, a relay race that will include kid jumps, wheelbarrow races, and other obstacles!” Julie asserts. Free food, drinks & fun!